Brewster County Courthouse Alpine Texas. The Brewster County Courthouse in Alpine is the only one they ever had (like neighboring Marfa). It was built in 1877, by an architect who has since been forgotten. It comes with a matching jail and there's even a traditional piece of artillery on its east lawn. 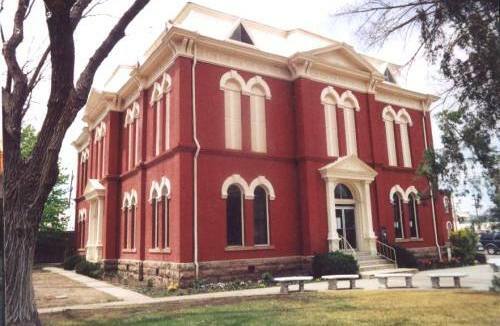 Courthouse building erected in 1887 when Brewster County was created. Served Buchel and Foley County until these areas were added to Brewster County. 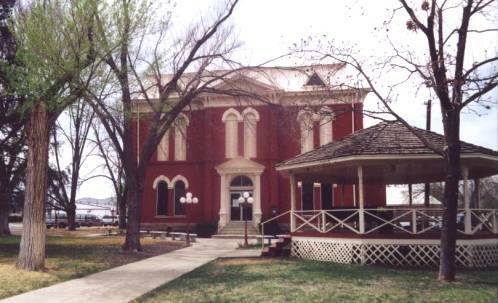 Courthouse Square still is community center for various events. Recorded Texas Historic Landmark. 1965. 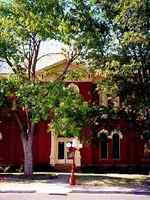 COURTHOUSE IN ALPINE COMPLETED IN 1887 BUT NO ONE SEEMS TO KNOW WHO BUILT IT. No one seems to know who built the courthouse in Alpine. In 1940 when The Avalanche issued its 50th anniversary edition, an effort was made to find out who did the work, but no body knew. The report, given then, is all that is known today-unless somebody is keeping secrets. 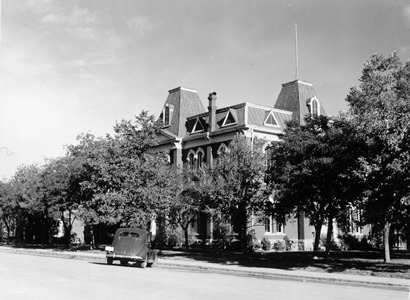 On March 14, 1887, soon after Brewster County was organized, the commissioners ordered that architects be contacted by letter to discuss plans for a courthouse and jail, the former to cost no more than $12,000 to $15,000, and the jail to cost no more than $12,000. 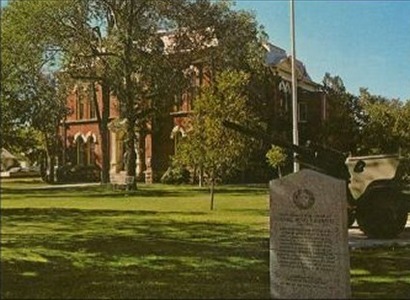 A little later bonds were voted in the sum of $28,000, and either that amount or $27,000 was expended for the two buildings - the courthouse and jail both stand today, giving good service. Two or three men got the contract for the buildings, but all the scurrying around that has been possible for one newsman in a comparatively limited time has failed to unearth the names of the contractors. Even the dependables for old-time information - Judge Van Sickle, Mrs. Walter Garnett or Mrs. J. C. Bird could not recall. However, it is said that the contractors burned their own bricks for the building, or had a man to do the work. They were burned in kilns near Ranger canyon, and the name of Harry Dryden kept bobbing up in connection with the job. Still, it is not certain, so far as could be discovered, that Mr. Dryden ran the kiln. He did burn bricks later, if not then, and it said the rear part, at least, of the building on 5th Street, now occupied by the Stephenson laundry, which housed the post office until four or five years ago was built of Dryden brick. Mrs. J. C. Bird recalled distinctly however, and so did her nephew, James W. Walker, that J.C. Bird burned the lime that made the mortar that held the bricks together. This was done also, it is understood, somewhere near Ranger canyon, west of town. The courthouse was finished probably in November 1887, and throughout its construction the county commissioners met every few days, or at least quite often as is shown by their minutes, but not a word could be found in regard to the contractors, nor anything else relative to the construction. Also see: Woodward, Tommy R., "J. C. Bird: A Big Bend Pioneer." The Journal of Big Bend Studies, Volume V, Alpine, Texas: Sul Ross State University Press, January 1993, 15-36. Our sincere thanks to Mr. Woodward for his contribution.